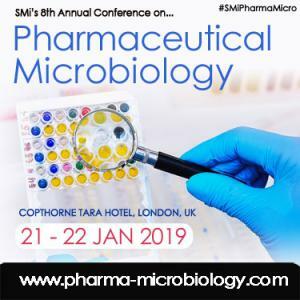 SMi’s is proud to announce the 8th Annual Pharmaceutical Microbiology UK conference is back, this year is taking place in London on 21st and 22nd January 2019. James Drinkwater is Head of Aseptic processing technologies & GMP compliance for Franz Ziel Germany, supporting international projects from a base in the UK. As a subject matter expert in Barrier separation technology; Isolator / RABS and hydrogen peroxide vapour bio-decontamination, James is involved in applications of sterile pharmaceutical product Filling, Aseptic processing of APIs/ ATMPs and Sterility testing. In addition to the role at F Ziel James has a voluntary role as Chairman of the not for profit society: PHSS – Pharmaceutical and Healthcare sciences society and leads the PHSS Aseptic processing & Bio-contamination special interest group. Alexander from Germany always had a high interest in the field of molecular biology and he completed his PhD thesis in Microbiology/Genetics during September 2001 at the University of Kaiserslautern. After moving to Sweden, he started working in December 2001 for Fresenius Kabi sterile international manufacturing plant in Uppsala, leading a group of microbiologists responsible for microbiological qualification of sterilization processes. Throughout the years Alexander has been holding different management positions for the Swedish manufacturing plants within Quality Control, Quality Assurance and as a Qualified Person. Starting 2012 he had responsibility as a Global Operations QA head, with regional QA and plant QA functions directly reporting to him. In his current position as Vice President Competence Center Microbiology & Aseptic Technique he has built a group of subject matter experts working with all pharmaceutical Fresenius Kabi manufacturing sites and compounding centers, setting global standards. Throughout the years he has gained intensive hands-on experience from different sterile manufacturing techniques for finished medicinal product & API and multiple international authority inspections. Di – MRSC Chemistry and PGDiPS and a Qualified Person under permanent provisions since 1993; Pharmaceutical industry for over 30 years/ a number of years as a Medicines Inspector for the MHRA. Di/worked in the areas of Quality Control (Chemistry and Microbiology), Quality Assurance and Regulatory Affairs/worked with a wide range of dosage forms including sterile products, biological, and non-sterile products. Marine is Scientist in the Analytical Sciences department of Sanofi Pasteur in the Microbiology/Virology platform. She leads the development, validation and implementation of rapid microbiology methods (bacteriology and molecular biology) for legacy and investigational products. She is an internal SME in endotoxin, mycoplasma and mycobacteria testing. Marine holds a M.Sc. in Biotechnology and Applied Microbiology from ESIL University (Ecole Supérieure d’Ingénieurs de Luminy) in France. Philippe Dutot is Engineer in Biotechnology and he has a PhD in Molecular and Cellular Biology. He has around 25 years of experience in biotech and pharmaceutical industries at different management and specialist positions in R&D, Scale-up of Production, Quality Control and Quality Assurance. He is currently Sterility Assurance Specialist at Novo Nordisk Production – France in a facility dedicated to manufacture of aseptic products. He is also Corporate Lead Auditor for his company. Renate's career originated from science and research through her work in academia which is for more than 40 years marked by a continuous interest in the infection biology of mycoplasmas, and their detection, prevention and control. Her passion for mycoplasmas took her to the University of Veterinary Medicine Hannover in Germany, the University of Missouri-Columbia in the US, and the Hadassah Medical School of the Hebrew University in Jerusalem, Israel. Thierry obtained his Pharm. D pharmacist with special degree in Industrial Pharmaceutical Microbiology in 1996. He joined Sanofi Pasteur in 1997 as QC Bacteriology manager in Industrial Operation. He joined the Analytical Research and Development Department in 2004 and since that time he worked in the development, the validation and the implementation of Microbiology alternatives methods based on bacteriology and molecular biology for commercialized products and clinical products. He is currently Microbiology Platform Leader in Analytical R&D and part of the USP expert panel in Modern Microbiological Methods (MMM) since 2015. Tim B.Sc. (chemistry) has over 25 years’ experience of sterile manufacturing with Zeneca Pharmaceuticals and AstraZeneca. During this time he has had extensive roles in technical support, production management and specialist activities for aseptically prepared products. The conference also has 2 interactive half day post conference workshops, which provide extra value to the pharmaceutical microbiology conference, which are taking place on 23rd January 2018 at the same venue. If you are interested in participating and attending the conference, you can register at www.pharma-microbiology.com/PR1, and save £400.